Great minds think alike! Heidi shared a great pork tenderloin recipe yesterday and pork is on the menu again today. It’s a healthy alternative to beef! 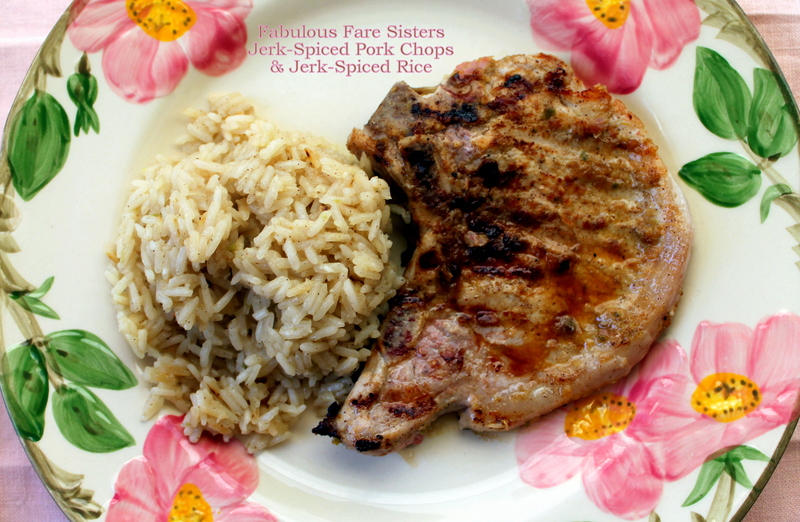 I really like Jerk seasoning and haven’t made it in a while…with this meal I decided to not only marinate the pork chops in the jerk seasoning but to also make a rice with the same marinade. It turned out great! Here’s another addition to the Pork Night Repertoire! Note: My mom recently came to visit me for a few days and she brought along with her some lovely linens…she wanted me to use them for our blog! She’s such a sweetie…so Mom, here’s the pink one…Thank you for giving me such lovely linens!! Place the pepper, shallots, garlic, lime zest & juice, brown sugar & spices along with 1/2 teaspoon salt & fresh ground pepper in a food processor. Add three tablespoons extra virgin olive oil and pulse until relatively smooth. Set aside 1/4 cup of the jerk marinade. Spread remaining marinade over all the pork chops and allow to sit while you’re preparing the rice. In a medium saucepan, heat a tablespoon of extra virgin olive oil over medium-high heat. Add 1 cup jasmine rice and sauté a few minutes. Add in the reserved 1/4 cup jerk marinade and 1/2 teaspoon salt. Stir until combined. Pour in the chicken broth. Bring to a boil; reduce heat, cover and simmer until tender (~10-12 minutes). While the rice is simmering on the stove, cook the pork chops. Using a grill pan, grill pork chops 4-6 minutes on each side until just done. Remove from pan, cover with aluminum foil and allow to rest to redistribute the juices. Serve the Jerk-Spiced Pork Chops with the Jerk-Spiced Rice. Enjoy! This recipe has been added to HaddonMusings where fellow New Jerseyite Bernadette shares her wisdom and insight and the goings-on…Go check out our Haddonfield neighbor! This recipe has also been shared on Fiesta Friday – This is a great site to go visit and see so many wonderful blogs! The table linens are lovely, how sweet of your Mom. I recognize those plates as well, but haven’t seen the pattern in years. Thank you for bringing them to FF. I had this pinned before I even finished reading it. 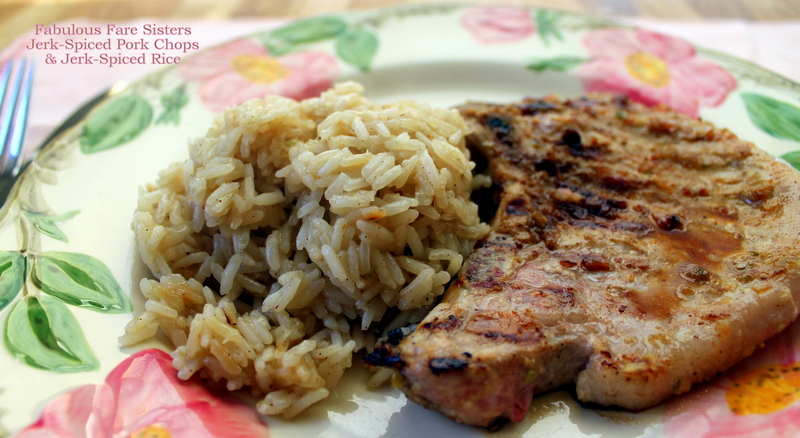 We just love pork chops, and jerk spiced sounds amazing. Fantastic idea with that rice! Great families think alike! You, mom and Heidi! Jerk seasoning reminds me of my visit to Jamaica 4 years ago. Now I’m itching to go back!! I know a lot of people like to go to Montego Bay and that’s okaaaay…but you really get a feel for Jamaica as a COUNTRY in Negril. Glad you stopped by and posted this. That sounds wonderful and your instructions and pictures are so good that I just might try it. 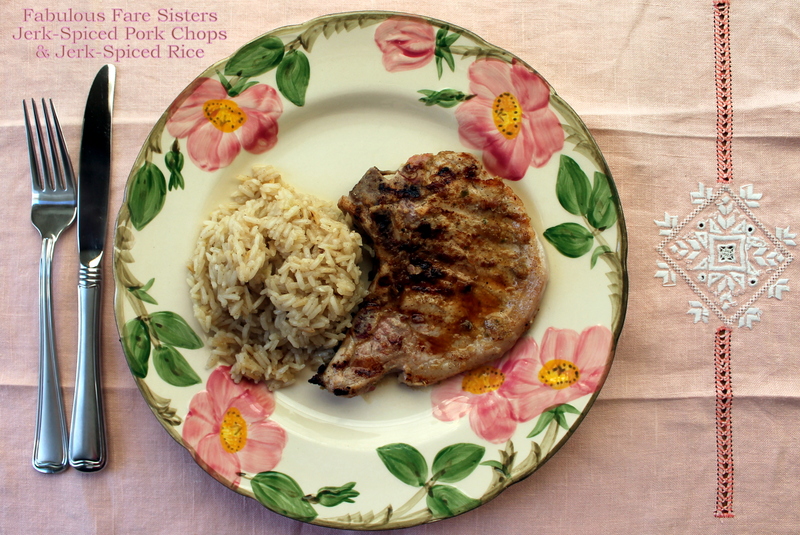 I just love spicy foods, and this jerk-spiced pork and rice sound so tasty! The dish looks so perfect with linens. Can never get enough pork recipes. I don’t know if you qualify for the Senior Salon, but if you do I would love to see you post. love the linens, plate and recipe!! Pork chops are one of my favorite proteins! I will definitely try this recipe! Mum was awesome to have brought the linen. It’s being a family affair for you in the past couple of post :). that is great. Family is everything.